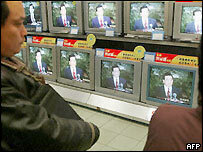 China says it will refuse to allow any new foreign-owned television satellite channels into the country. The government also said it would tighten controls on the 31 international broadcasters already operating in China. The Culture Ministry said the step would "safeguard national culture". The move comes just a month after China issued a regulation banning Chinese media companies from forming partnerships with foreign broadcasters. China "will not again allow a foreign satellite TV station to have landing rights in the country," the culture ministry said in a statement announced by the state news agency Xinhua. The move will "strengthen management of imported cultural products, improve intellectual property protections and safeguard national cultural safety," the culture ministry said. It added that the government would also ban new licences for companies to import newspapers and magazines, electronic publications, audiovisual products and children's cartoons. The announcement is likely to annoy international broadcasters eager to increase their reach in China - whose people reportedly own a total of 400 million television sets. Correspondents say it is also evidence of a mounting government campaign to regain control over popular culture, and curb material that communist leaders worry is spreading negative influences. According to a BBC correspondent in Beijing, Daniel Griffiths, China's once firm grip on the media is slowly weakening as technological advances allow more people to access information. Economic reforms have produced sweeping changes across the media industry, with hundreds of television channels, newspapers and magazines now available, he says. Reports on previously taboo subjects, like official corruption, are on the rise. China also has more than 100 million internet users, and many people now have new mobile telephone technology, which allows them to access the web from their handsets. Foreign players who currently have broadcasting rights in China include Rupert Murdoch's News Corp, Viacom's MTV and News Corp-backed Phoenix Satellite Television, which all broadcast in Guangdong. Tom Group, controlled by Hong Kong's richest businessman, Li Ka-shing, also owns a station with broadcasting rights in Guangdong. Overseas players with limited broadcasting rights in the market include the BBC and Time Warner's CNN, as well as various channels owned by News Corp's Star TV subsidiary.